(L) Horned helmet. Bronze, glass, Found along the Thames river near Waterloo, London, England (200-100 BC). (R) Greek helmet, bronze. Olympia, South-Western Greece (460 BC), The British Museum.Photo by Medievalists.net. I attended the opening of the British Museum’s, Celts: Art and Identity exhibit on Sept 24th. It showcases stunning art, jewellery, weaponry, daily and religious objects to tell the story of the Celtic people. There were so many amazing pieces that choosing a few select items was a daunting task, but if I had to pick my 5 favourites, this would be my list. 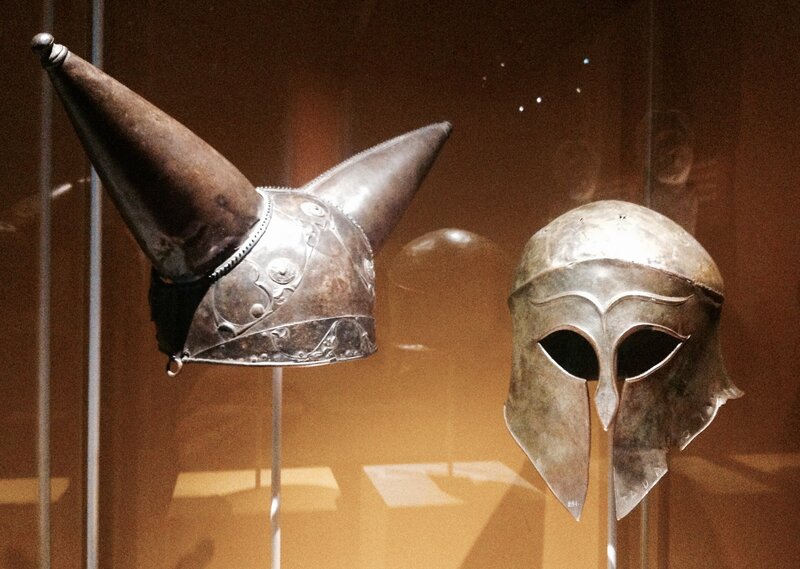 The helmet on the left is Celtic, tossed into the river Thames over 2,000 years ago, the helmet on the right belonged to a Greek warrior and was inscribed to the God Zeus. (L) Horned helmet. Bronze, glass, Found along the Thames river near Waterloo, London, England (200-100 BC). (R) Greek helmet, bronze. Olympia, South-Western Greece (460 BC). The exhibit runs until January 31, 2016. The Ancient Greeks viewed the Celts as a fearsome, warlike people with strange customs that set them apart from the “civilized” world. They were considered “Northern Barbarians”. Greek historian Diodorus Siculus (90-30 BC) described Celts wearing these horned helmets into battle. This particular helmet was tossed into the Thames 2,000 years ago, most likely as an offering to the Gods. Horned helmet. Bronze, glass, Found along the Thames river near Waterloo, London, England (200-100 BC). Imagine keeping all your favourite books encased in something this beautiful? This is a book shrine, a ‘Cumdach’ in Gaelic. The story behind this stunning piece is that it belonged to the powerful O’Donel clan of Ireland. This royal family were the keepers of a book of Psalms called the Cathach (‘The Battler’) which was supposedly written by St. Columba (d. 597 AD) sometime in the 6th century. The family commissioned a shrine to house the delicate manuscript for safe keeping. Before battle, this important relic was paraded clockwise, 3 times around the army by a monk. It was believed it would protect the army and ensure victory in battle. The Cathach is the oldest surviving manuscript in Ireland. Bronze, gold, silver, wood, rock crystal. Ballymagroarty, Co. Donegal, Ireland (1000-1450 AD). There were quite a few swords in this exhibit but this one caught my eye because of its colour (red, which happens to be my favourite) and how well it was preserved. The sword belong to a young man who was buried equipped for battle, and this sword was worn strapped to his back. It’s unusually elaborate for a weapon; inlaid with red glass on the handle and scabbard. The man who owned it was most likely high status and considered a powerful warrior. Iron, Bronze, Glass and Horn. Kirkburn, East Riding, Yorkshire, England (300-200 BC). Celtic people were influenced by the Romans but managed to put a unique stamp on their art and jewellery. These beautifully decorated and intricately carved bands demonstrate this distinction. These enormous armlets from North-Eastern Scotland were worn by men as a means of showing off their muscular builds and their strength. The armlets weigh 1.5kg each (3.3lbs) and were decorated in ways that expressed local identity. I loved these for their colourful design and the sheer size of them; although they do not look remotely comfortable to wear. The size and weight of Celtic adornments like armlets and torcs was impressive throughout this exhibit giving a whole new meaning to, ‘Go big, or go home!’. Bronze, enamel. Drummond, Perthshire, Scotland (50-200 BC). Although not all torcs were gold, my favourite ones at this exhibit happened to be the gold ones. Torcs were large neck rings made from one piece of metal, usually, gold, silver, bronze or iron, or several pieces of metal twisted together with an opening at the front. They were popular in the Mediterranean and made their way north between the 8th century BC to the 3rd or 4th century AD. There term ‘torc’, comes from Latin meaning, ‘to twist’. Torcs were a sign of high status in Celtic society, along with bracelets, and armlets. Many torcs were found buried with high status women. While they are lovely to look at, like the armlets, most torcs wouldn’t be comfortable to wear for extended periods of time. Torcs certainly have a timeless aesthetic; some of the designs at the British Museum could’ve easily been sold in a modern jewellery shop. This torc came from a Scottish hoard around 300 BC.